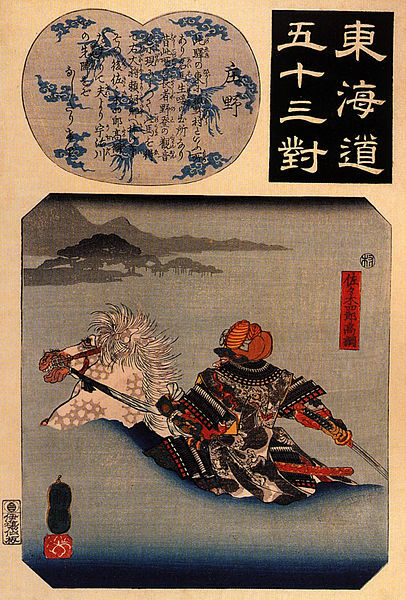 Takatsuna boasts that he will be the first to cross the river to confront the enemy, although Samurai Kajiwara leads the race. Takatsuna outsmarts him by shouting, “Look out, your horse’s girth is loose,” thereby distracting him. Takatsuna wins. No different from when we were hunter pacing and losers would pull down the directions so we would all get lost, thereby ruining our times so they could ribbon. Which is a rotten thing to do to people who got up at 5:30am on a Sunday, spent $100 for an entrance fee, gas on driving there, and all the work in cleaning tack and horse. I guess it’s the only way those kind of people can win, but REALLY where is the joy in winning when you know you cheated?! I will never understand.